32 pages, 8.5" x 11", Four-Color, Romanian, 2009. News: Now updated to a completely new 3rd Edition in a variety of languages. Thank you to everyone involved with the production of this new edition, especially those, like Dr. Jose Morcuende at Ponseti International, who edited and proof-read the book for up-to-date medical accuracy. Translations of this new 3rd Edition are also underway. Please let us know if you would like to help. This book provides information on all aspects of Ponseti management of Clubfoot. The book was authored by Dr. Lynn Staheli, Dr. Ignacio Ponseti, and others, who have all mastered this casting technique. We recommend that Dr. Ponseti's technique be learned in a course using this book as a reference. 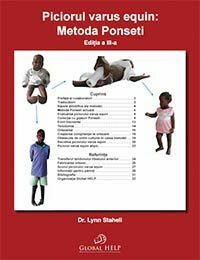 We produced this book to provide an affordable, authoritative, easy-to-follow guide for health-care professionals to learn the Ponseti method of Clubfoot management. This book is designed to be engaging and colorful, with sufficient detail to help newcomers master the method. For the Turkish translation, Nadire Berker and Selim Yalçin distributed hundreds of books at the orthopaedic meeting in Antalya in May of 2004. Shortly after, they received about one-hundred e-mails from all over Turkey requesting copies of the book. This is the third edition of this book, with some translations already existing for the second edition. The first edition was published in November of 2003 and translated into four languages, and 10,000 copies were printed and distributed in over 50 countries. In the 2005 second edition, we have shortened some sections while adding others to make the book more complete and up-to-date. Guided by feedback from the authors and readers, the book has been reorganized. Each of the authors has contributed their material and experience. A third edition was published in 2009. With even more up-to-date information and an even easier-to-read format, this third edition is now being translated into multiple additional languages for even broader distribution. Bonus: Thanks to the generosity of the Department of Orthopaedic Surgery & Rehabilitation at the University of Iowa and the Ponseti International Association, Ignacio Ponseti's "Congenital Clubfoot: Fundamentals Of Treatment" is also now available for free. Please visit Ponseti International's web-site at http://www.ponseti.info/publications---resources.html to download a PDF copy of the book. Romanian translation by Alexandru Thiery.